Good Beer Larry - Food and Beer Page - Food Pairings, Events and Cooking with Beer. The beer and food section of this website has cooking with beer, food pairings with certain styles of beer and other ideas from the many beer dinners I have attended over the years. Beer and food pairings have become popular and can be fun experiences. Beer goes well with many foods and with the many different styles and flavors now available there and lots of ideas out there. This is a service now offered; Contact me for more details on how to have your own beer and food pairing or dinner. This has really caught on; just in the last month I have been to several beer and food events. They can range form small groups to a full "festival" type of atmosphere. One event was our local Whole Foods store had a beer dinner with four different beers and four different food items. This went well and they want to have one every few months. The other was the "Brew it and they will come" event in Jupiter, FL. My review is HERE and the full menu is HERE. I will have some short reviews of some events and links to great places that have food and beer as their specialty. The Gastropub concept is coming of age; it originally was from London and if has been adopted on this side of the Atlantic. Two quick examples: I visited Ohio and found the Tremont Tap House Cleveland's newest gastropub. Great food to go with many good beers. Another gastropub is the Ravenous Pig in Winter Park FL. I have been there several times and they never disappoint. Visit either website for more details. I will add more as time permits. Meanwhile there are several beer and food stories below. Happy drinking and eating!! Thanksgiving Beer Tasting - Beers for each Course! 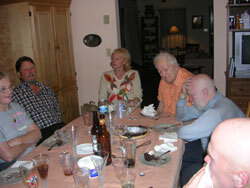 This beer tasting was done on Thanksgiving a few years ago in Highlands, NC. It went very well for the mixed crowd; some not really beer drinkers or wine drinkers. It went from "cocktail" hour, before, during and after dinner. The original idea appeared in the Miami Herald the week before the trip up and they got some of it from Beer Advocate. Of course it varied here as no two events are the same. The beers and courses form this event. Dinner is served: For the full, complex and fatty flavors of and all-out Thanksgiving main course, you want a muscular beer, with the hops and alcohol to cut through. The category called Belgian-style strong ales works here. Avery Collaboration not Litigation Ale, Colorado, 8.99 percent alcohol: dark brown color, sturdy beige head, starts fruity, then the powerful alcohol kicks in. It'll handle Cajun turkey, even red meat. Ommegang Brewery Rare Vos Belgian-style amber ale, Cooperstown, NY, 6.5 percent alcohol: coppery color, fruity, spicy, muscular, flavors of burnt sugar. 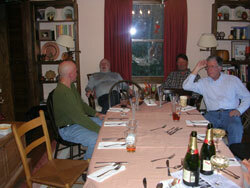 This was one of the first cooking with beer type events; done back in 2007. The article was written shortly after. Thanksgiving; what better time to think about food...and good beer! 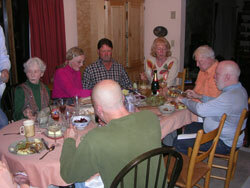 On Thanksgiving I joined my family and relatives at the family farm in north Florida. A few days earlier I received an e-mail about a recipe for beer injected turkey. What a great time to try it. I loaded up the car with good beers, many not available at the farm, and headed there. On Wednesday I injected the bird with a pint of St Rogue Red Ale. It cooled overnight and was deep fried as per the recipe. The result was tasty, moist turkey; the beer bird went over well. There were two turkeys cooked; one conventionally and the other injected and deep fried. The injected bird was moist and the taste really came out. The other bird was marinated in a brine solution and was moist but not quite as tasty as the injected bird. The beers I brought along also were voted to be the best. There were organic pale ales (Lamar Street) and IPAs (Ell River Organic). 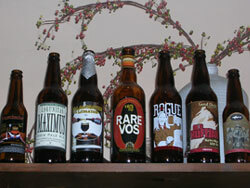 Imperial Stouts (Left Hand) and many others, too numerous to list, also were enjoyed. My reputation as the good beer guy lives on and everyone looks forward to our next get together to try some new and interesting beers! Drink Good Beer with Good Food!